Details at the end of this post on how to enter to win a copy of An Unhappy Medium, and a link to purchase it from Amazon. The mostly retired Altadena, California gardener would prefer to tend the land of his one remaining private client, but instead Mas finds himself hired as a driver and translator for Kimura “Yuki” Yukikazi, the grandson of Mas’s childhood sweetheart. Yuki has come to replace the late journalist and claims to be following in the footsteps of his mentor. Born in America but educated in Japan, Mas has lived in California for over forty years and yet still feels distinctly Japanese-American. Mas survived the bombing of Hiroshima and still carries haunting traumatic memories that, unlike this new generation, he is unwilling to share. 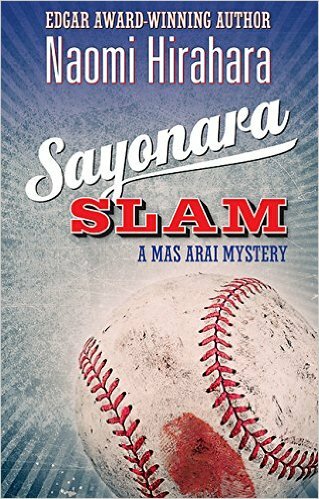 Used to being overlooked and underestimated for being Japanese, a senior citizen, and more silent than talkative, Mas is a stellar investigator who observes and grasps more than most the motivations and secrets of those around him. What Naomi Hirahara so skillfully conveys are the complexities and miscommunications between cultures, generations, and sexes. A widower who loved his wife and yet rarely spoke the words, Mas is unsettled with the state of his relationship between himself and his girlfriend, Genessee. Mas fears that committing to the African-American professor would mean displacing or erasing the memories of his late wife, and he is unable to voice these concerns to the woman who seems to express her feelings so easily. Mas’s interactions with his prickly daughter have eased to a state of détente, but while her long-held resentment has eased, Mas himself is growing uneasy. Having his daughter and her family sharing his two-bedroom does prohibit his having to make a decision about Genessee, but it also has Mas straining at the confines of his crowded space. Mas’s quiet exterior hides a sharp and very dry wit that always make these novels so entertaining and fun to read. Through this humor and cleverness, readers will find themselves immersed in a novel that explores the clashes between cultures, yet how one sport allows them to interact and share one playing field. To enter to win a copy of Sayonara Slam , simply email KRL at krlcontests@gmail[dot]com by replacing the [dot] with a period, and with the subject line “slam,” or comment on this article. A winner will be chosen May 14, 2016. U.S. residents only. If entering via email please include your mailing address, and if via comment please include your email address. Great twists…collapsed reporter on Dodger field? I knew it, that place is a jinx. I enjoy the idea of culture clashes. Thanks! Sounds like an interesting series. Thanks for the chance to win. I love Naomi’s writing – and how can a baseball fan not want to read this one in particular. I’m IN.